Our testimonials and success stories abound! Mr. Ma has been SO incredibly helpful for me because he’s been able to provide such insightful advice that’s so on-point. He was able to identify my unique strengths and talents early on, catering to my personal interests and complementing my activities and passions. One of the most memorable meetings with Mr. Ma is when he hit the nail in the head, articulating my strengths, my passions, and what my goal for the future is (and that is to be a CEO of some sort, or be a leader in a key industry driven by a passion of mine) — in a way that maybe I was struggling to do so. Mr. Ma has had a tremendous impact on my development as a person. Through our coaching sessions, which felt like conversations with a friend, Mr. Ma guided me to set aggressive goals and expect more of myself. After four years of working with Mr. Ma as my mentor, I can attest to his persuasive and engaging personality. He took the time to understand my unique skills and perspectives and helped me sharpen my focus and drive for all-around, genuine excellence. My interaction with Mr. Ma has enriched my understanding of the key drivers for long-term success — not just in business but in life. My relationship with him has grown from him being a mentor to being a true friend. Hi, Mr. Ma!! Thanks so much for the huge support and encouragement the whole way through…I would not have applied to Harvard EA without your insistence!! In addition, thank you for all of your counseling and advice…I am truly very grateful and honored!!! Mr. Ma has been a major support system for me since I was a high school student. As an upperclassman at UC Berkeley, I continue treasuring his mentorship of me. He has a heart for coaching students like myself to help them realize their full potential. He cares deeply about his students and their well being and future. One of my memorable experiences with Mr. Ma was that he selflessly worked late into the night on New Year’s Eve with his students. This speaks to his dedication and passion toward helping students succeed. I am very grateful for all the help that I have received from Mr. Ma. Mr. Ma taught me these leadership skills. He really helped me become a good speaker and communicator, putting my thoughts in perspective and helping me communicate with people in a meaningful way. In the real world, we need to interact, and apply what we know, with others. EQ is just as important as IQ, if not more important. …..While operating in the stressful time of college application season, Mr. Ma displayed a calm demeanor while maintaining a cheerful attitude. His ability to display professionalism while dispelling all fears and worries was truly admirable. This duality has helped me throughout my college career to be successful in and out of the classroom. …..Having an Industrial Engineering and Operations Research (IEOR) background, Mr. Ma’s application of operational excellence allowed me to make smarter life choices and better tailor my interests. As a current mechanical engineering senior at the University of California, Berkeley, I endeavor to replicate Mr. Ma’s practice of operational excellence. His attention towards maximization and efficiency provides a basis for many of my engineering and career decisions. Ultimately, I thank Mr. Ma for his consulting advice, for without him, I would not be where I am today. Throughout high school and even in college, Jason Ma has been a tremendous mentor and resource to me. In high school, I was guided by Mr. Ma through the stressful college planning and application process. He patiently worked with me and ensured that I was able to effectively communicate my strengths and aspirations to top universities. As a result of his guidance, I was able to attend my top-choice school, Duke University. Even today, Mr. Ma has kept in touch with me and has provided valuable advice and insights on potential careers that I was considering. From all of this, I now have a road map of how I can accomplish my career ambitions. It is my pleasure to recommend Mr. Ma to any aspiring student that is looking to leave his or her mark on the world. I heard back from all my remaining colleges yesterday and got accepted to UPenn College of Arts and Sciences! I’ve been estatic these past few days, and I just wanted to thank you for all your help these past few years. Without your wise advice about SATs and your reviews of my applications, not to mention all the questions you’ve answered remotely for me and numerous other details you’ve advised me on, I could not have done so much and gone this far. Thank you Mr. Ma for helping me on my way! I am 100% sure I’m going to be attending Penn next year, and I can’t wait to be a part of their undergrad IR program. Thanks again, my family and I are very grateful! I want to thank you with my innermost sincerity for all that you have done in guiding my academic planning, personal development and college applications. Working with you has been more than inspiring and rewarding. The scene of my first meeting you and weeping in front of you in my sophomore year is deeply imprinted in my heart. It is by no means an exaggeration to attribute the stimulus of my turning point in life to you and your team. When I deviated from the light of learning and lost my direction with a confounded mind, it was you who motivated me to embrace my former assiduity; it was you who showed me the path to success; and it was you who encouraged me to indefatigably run toward my future. …..The innumerable times of commenting on and re-proofreading essays, the scrupulous examinations of applications, the critical updates and follow-ups, the eye-opening ideas and suggestions, the more than strong sense of responsibility, the admirable mission beyond that about responsibility… My experience with you has been a life-changing one, with or without the final results. I want to thank you for everything you’ve done for me, from helping with my applications to helping resolve my financial aid situation. The latter was not something that you had to do, yet you still went out of your way to help me during a difficult crisis. I am forever grateful for your help, and I know that my parents are grateful too. Thank you so much for taking your time to join Project Pengyou for the panel talk tonight! Our event went extremely well and it definitely wouldn’t be this successful without your support and participation! The students told us after the event that they were intrigued by your speeches. They were really enlightening and the students learned so much about how to succeed either here in America or in China, the difference in job markets and opportunities between US and China, as well as your personal life stories as a student and your career path! I never thought I would be sending you such an email at the conclusion of this admissions cycle, but I am. I would like to inform you that I have, I quote exactly, “been offered a place in the Class of 2020 at Duke University.” A dream come true for me, and you cannot imagine my joy and excitement as I saw those words on the portal. More importantly, I would like to express my sincere thanks to you for everything you have done for me in the process of this application — regardless of the result of my applications. …..I want to say thank you for being so dedicated and 110% serious about helping me not only to gain admission, but also, more importantly, to improve and become a better, more competent person, for being such an on-the-ball and responsible mentor (even more than me at times! ), and for teaching me so much about how to succeed, be driven, and be passionate. I feel deeply grateful and extremely humbled to have had such a selfless, outstanding mentor. You are an inspiration to me in many ways, and I value the lessons you have taught me. They will stay with me as I go to Duke and beyond. I sincerely hope to continue learning from you and keep in touch. Mr. Ma’s mentorship is like navigation during a long sailing expedition. I have a destination in mind but adversities, like strong headwinds, have thrown me off and Mr. Ma’s guidance brings me back on course. Mr. Ma really cares and has diligently helped me make adjustments to my journey, which seemed subtle at first but have a large effect over time. The effects of the adjustments include my success in university admissions and, more importantly, the mindset to optimize my life. Many students are driven. But without a strategic, actionable, and individualized plan like the one Mr. Ma helps students craft, they will not achieve the same results. The following are some of our testimonials from parents, C-suite executives, event organizers, and media outlets through the years. Many of our happy clients, especially parents, prefer to keep their families’ engagement with us private. Thus, their kind words for us are excluded from being shown here. Many many thanks to Mr. Jason Ma & his team. Words cannot describe our gratitude! ThreeEQ services have prepared my daughters for successes in life by equipping with them the right mind-set, training them the usage of correct life’s formula, and inspiring them to be creative in all areas of their lives. My daughters are ready for whatever that comes at them in life & they are ready to create a life for themselves and others in their world. In the beginning, we started out not sure what ThreeEQ can do for my daughters at age 14 & 11. However, by making the commitment & doing the work, we are amazed with the results my daughters have received. Again, THANK YOU Mr. Ma!!! Thank you very much for all your help and guidance. We didn’t even know we must execute those requirements prior to meeting you. Without your help and wisdom, my son wouldn’t have applied to Stanford Early Action and wouldn’t have gotten in! My son is doing well. I believe his early consultation with you was very effective. Thanks again!! My daughter was accepted by UC Berkeley and NYU. She cannot get in Berkeley without your important and high quality guidance. Your great help would be always appreciated by our family! Take Care and thank you again for your great work! Thank you so much! You’re a great speaker! I love the way you talk. On behalf of The Asian Strategy & Leadership Institute (ASLI), I would like to thank you for taking time to share your invaluable perspectives with the participants at the 8th World Chinese Economic Summit 2016. Your participation has indeed contributed significantly to the success of the Summit. We certainly look forward to the privilege of working with you again in our future events. It was truly a pleasure to host Jason Ma as an honorary speaker at the APAC Investments Summit 2015, where he addressed some of the region’s top family offices and institutional investors with excellent insights on empowering the next generation for a sustainable future. Jason is a highly engaging speaker and a fantastic collaborator, and I do not hesitate to warmly recommend him to any event organizers. On behalf of Business Rockstars, we wanted to personally thank you for your great guest appearance on the show. Your segment was both insightful and entertaining! You’re a millennial mentor who cares about the future of the generations to come. Your book Young Leaders 3.0 is a must-read for all aspiring entrepreneurs! Jason’s experience as a speaker made it very seamless and straight-forward to collaborate with him for our Fireside Chat. His passion to educate and empower the next generation of leaders emanates with each word. His decades of experience in mentoring high performers gives him unique insight on how to build inter-generational bridges. It was a privilege to work with him! Mr. Ma left the audience speechless and awe inspired as he addressed issues that most high school/college students often stress out about. As a high schooler, I know that his words and wisdom have definitely helped trigger my passion and potential to bring about change and clarify issues that serve as a constant worry for my teenage mind. I am so ecstatic to see the next generation of young leaders that will inevitably shape the future under the counsel and advice of the humble and philanthropic Mr. Ma. Thanks for such a great interview. You work is very powerful and is changing the world in so many positive ways. Jason Ma is a very engaging speaker. His presentations are thought-provoking and educational for our sophisticated audiences. His ideas and proposals are concise and insightful. I thank him very much for presenting and contributing at Horasis global summits. 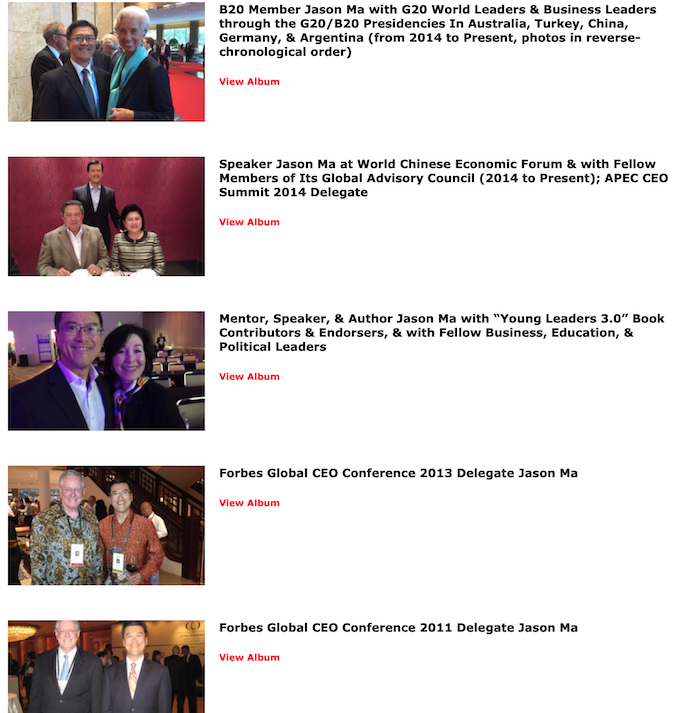 Jason Ma has proven to be an extremely astute company builder and a respected global business leader. I have known Jason Ma for many years. Jason is very knowledgeable about diverse business environments in Asia Pacific. He proved his strong business sense and leadership abilities and can get challenging things done like introducing new products in new markets and achieving leading if not dominant position in existing major markets. Jason Ma has impressed me as being very professional in conducting his business, very persistent in pursuing the objectives while being very pleasant to work with. I trust him implicitly. Jason was an invited speaker in my MBA class at INSEAD and my students and I were very impressed with his insight and energy. Specifically, I found his advice to students on how to structure their entrepreneurial careers as very actionable and useful. Jason Ma is a great networker with high energy. 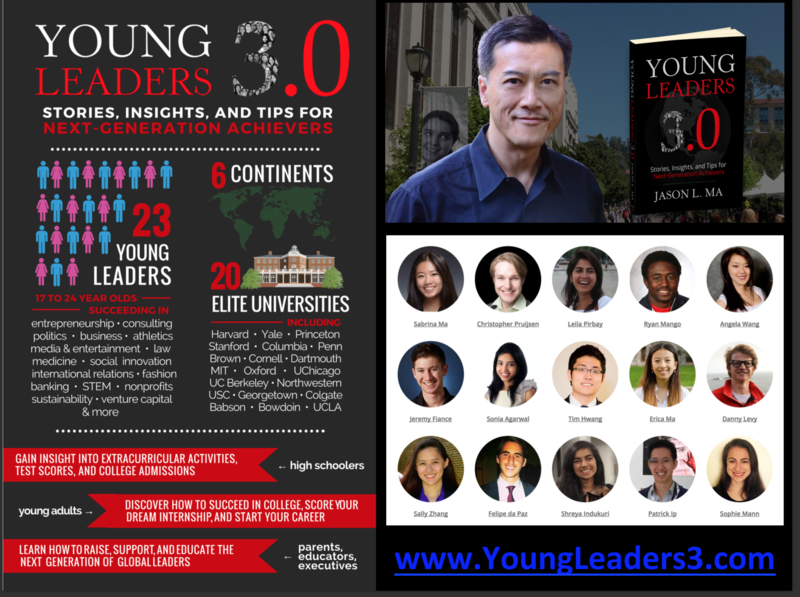 It is our gratitude that praise by luminaries and leaders in both education and business abounds (www.youngleaders3.com/#praise) for Young Leaders 3.0: Stories, Insights, and Tips for Next-Generation Achievers, an inspiring, groundbreaking book by author Jason L. Ma, along with a diverse group of 23 exemplary Gen Z and Millennial leaders as chapter contributors. Having earned the privilege to attend or speak at some of the world’s most influential business gatherings, Jason L. Ma has met some of the world leaders, private sector tycoons, global 1000 CEOs, and fellow business and education influencers. As mementos of these great meetings, Jason has garnered many photos with these renowned achievers.. .